Hi Everyone – another Cosmo Cricket Challenge this week and a chance to use the fabulous new 2WENTY-THR3E Collection showcased at CHA 2012. I was lucky enough to have been given a set of papers from this Collection and the Challenge was to alter a tin – but I have chosen to use a re-use a tin in a slightly different way. 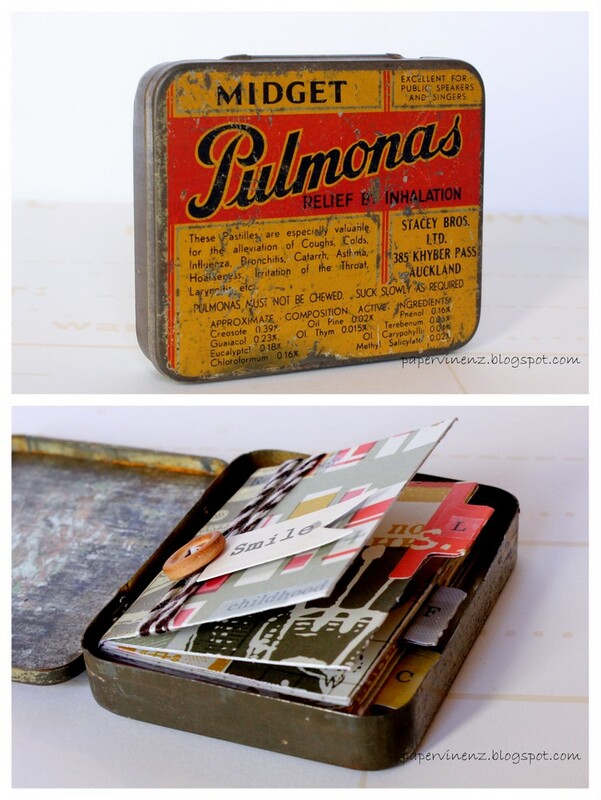 I LOVE to make these little albums and give them in vintage tins. I used the Postcards paper for the body of the book and then used some of the new Hello Washi Tape as a book binding. The “Smile” sentiment was cut from the Photo Booth paper and mounted with a small amount of dimensional tape. I created some tiny tabs and added the initials of my children with some Tiny Type stickers. how to create the album here. Fathers Day Mini-Album in a Tin! Please leave a comment with any questions and don;t forget to check back for the tutorial! Love, Love, Love Lowri!! I have a 'thing' for tins so this is right up my ally! I love this mini, and the binding is really cool. I would love to make minis as this one, so I will get back this week ! lol Thank you so much for sharing it with us, and for your lovely photos ! This is simply adorable. Beautiful work. protect your beautiful mini albums inside. Impeccable craftsmanship as always Lowri. TFS! So cute! I can't wait for the tutorial. I'm in love. I love scrapbooking and I am totally obsessing over mini albums now! I cannot wait for your tutorial. Where did you find those adorable tins??? So much character, I love them. Have a great week! Thanks Jess – I tend to pick them up at junk, thrift, antique stores.. Usually only a couple of dollars so less than a roll of wrapping paper!! I love your mini albums and i'm so happy you will share the tutorial of the first one! Thanks! Oooh, I LOVE this! LOVE everything about this! I saw this being featured on the Cosmo Cricket FB page – congrats! I was thinking that washi tape would be perfect for book binding – and you just confirmed that to be true! Gotta try it! This is sooooo fabulous, Lowri. LOVE it. Very fun and creative. I love these. So creative and unique! What a really cool idea! Love your albums and tins, they're too cute! I LOOOOOOOOVE those tins, Lowri, especially the Airman tin. I have a soft spot for the military. 😉 Your little minis are too effing awesome! Love 'em!!! Totally love what you did with Twenty-Three !